Sandwiches are a lunchtime staple in most households, but they can often be packed with sodium and preservatives from deli meat and processed cheeses. 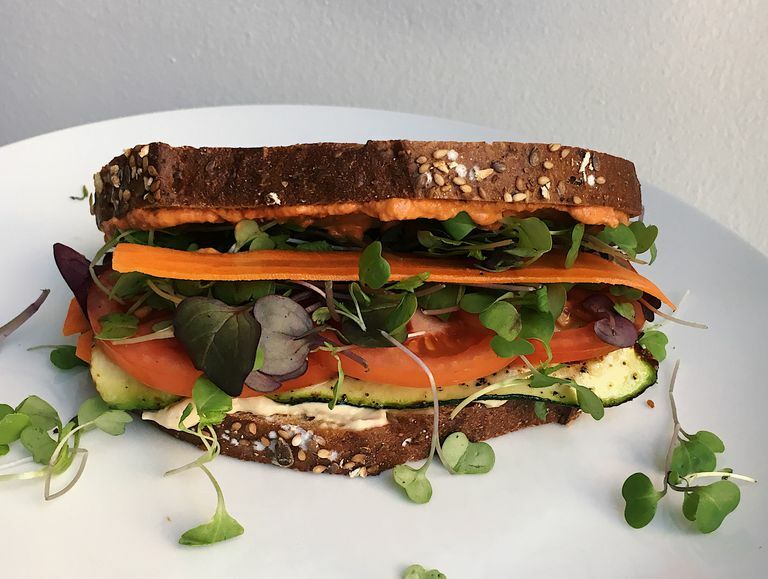 This sandwich is entirely plant-based, which gives you the convenience of a sandwich with the nutrition of a healthy meal. Slice carrot and zucchini into ribbons. Brush zucchini with olive oil and sprinkle with a little salt and pepper. Heat a frying pan over medium-high heat. Cook for 1-2 minutes on each side. Remove from heat. Combine spread ingredients (roasted red pepper to black pepper) in a small blender or food processor. Blend well. Assemble the sandwiched. Spread one piece of bread with hummus and the other with some of the red pepper spread (there will be leftover spread). Lay carrots, zucchini, and tomatoes. Add microgreens, then cover the sandwich with the other piece of bread. A cucumber can be substituted for the zucchini and does not need to be cooked. Pesto would also work well in place of the red pepper spread. Sprouts, arugula, or spring mix lettuce can be substituted for microgreens. Creating carrot and zucchini ribbons is best done with a peeling tool or mandolin slicer. Note that the spread makes four servings. Leftover red pepper spread can be stored in the fridge. Works well as a dip or as a pasta sauce.